How old is the Church? How long have there been Christians in Grays? The first firm evidence comes in 1040 A.D. when a Priest, Wulfstan the Wild One, inherited the Manor of Thurrock, and then in 1086, a Chaplain, Godwin of Thurrock witnessed a grant at South Ockendon. There is no evidence of a Saxon church either in documents or in the existing structure, although an earlier building may have been demolished. The earliest architectural style identified in the present structure and in old drawings is Norman, and it has been concluded that the present building dates from a few years either side of 1,100 and was built by the Peverels, who were then Lords of the Manor. We know that the church existed before 1160, for it was given to the Knights Hospitallers of St.John of Jerusalem by William de Ferrers sometime between 1152 and 1159. William Ferrers had come into possession of the Church and Manor by marrying Margaret the daughter of William Peverel and grand-daughter of the first Norman Lord of the Manor. William de Ferrers not only gave away the Church "for the safety of my soul, and for that of my wife, and for those of my predecessors and heirs" but also sold the Manor at about the same time to Isaac, son of Josce the Rabbi, showing concern for both his spiritual and earthly needs. The manor came into the hands of the King probably on Isaac’s death. This may have been a method of collecting death duties from those who were not the King’s subjects whereby their lands were confiscated and then sold back to the heir at a substantial discount. It was Isaac's son who sold the Thurrock manor to Henry de Grey in 1194. So started the long association of the de Grey family with the area, which was to give its name to Grays Thurrock. Returning to the story of the building, the oldest part consists of the present chancel and the part of the nave to a point a few feet west of the south door. The south chapel (now the organ chamber) is entered through an arch which is dated to 1280-90 and this has caused some authorities to date the chapel's construction to that time. However at least two 19th century drawings show early Norman round-headed windows in its east and west walls and it is more likely that the arch was introduced in order to improve access to the chapel and that the chapel dates from the original construction of the church, or even before, for it was the manorial chapel. The tower was added at about 1230. No additions took place whilst the church was in the care of the Knights Hospitallers, nor were they needed since the town was growing only slowly. In fact much of the income from the Parish went specifically to support the Priory at Clerkenwell. For 300 years after the Order was suppressed in 1540, the repair of the church was the main concern. The tower needed urgent repair in 1685, and the top part was taken down and rebuilt in 1722 and again in 1770 and it was rotten and unsafe in 1846. We now come to the two major re-constructions. In the early 19th century the population of the small market town of Grays was growing with the growth of industry and the church had to provide more accommodation. 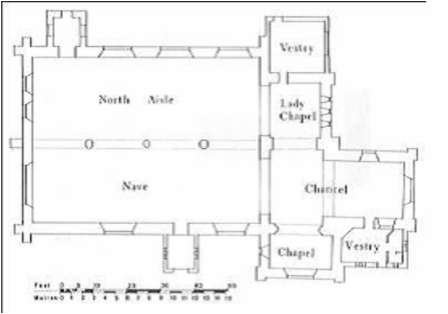 In 1846 the nave was extended to 50'10" from the chancel arch and a gallery was added. This was not big enough by 1867 and the nave was extended again to its present length and the north aisle added. It is supposed with reasonable certainty that the intention at the time was to add a south aisle when the population growth required it. However the need was resolved by building new churches, All Saint's in William Street, designated in 1886 and later, St. John's in College Road, now in Victoria Avenue. The earliest parts of the building were probably built around about 1100 AD To imagine the size of the church as it may have been then and as it was for more than 700 years there-after, stand just inside the south door and turn to face the east. The original church extended from just behind you to the east window with a small chapel where the organ pipes can be seen. The chancel was restricted to the area beyond the further of the two semi-circular arches. The tower was added about 100 years after the first building so that the church was then roughly cruciform in plan. Where the choir stalls are now, was then part of the nave where the congregation sat (or stood as was more common in earlier times). The floor would have been level through to the steps of the small chancel. The floor of the chancel with its six steps from the nave to the altar was tiled in marble in 1908. The brass communion rail is probably of the same period; (notice the "Art Nouveau" influence). The oak furnishings were given by various local people in memory of relatives. The reredos is a memorial of those killed in the 1914-18 war and the two eight-pointed crosses are a reference to the Knights Hospitallers who held the benefice for nearly 400 years. The helmet, sword and gauntlet are funeral accoutrements from the late 16th century. The east window was given by Mr. & Mrs. Meeson in memory of their children, three of whom died in 1861. The memorial of Anne Cox has a sentiment typical of its period. On the south wall opposite there are the remains of a brass of about 1520 showing two wives and six daughters, the husband and one son are missing. The two splendid carved chairs in the North Aisle are late 17th century. This was previously used as the organ chamber housing a good organ, but with the introduction of an electric organ this chapel has now been restored to use as The Palmer Chapel. In the south wall of the chapel is a 13th century piscina, (a basin for washing the vessels used at the eucharist). This was the Manorial Chapel and William Palmer, the founder of Palmer's College, is thought to be buried here. The two lowest stages are largely original construction, the bell stage is from the 1846 restoration. In 1985 a ring of 8 bells and 1 service bell were hung, 7 of these came from the redundant churches of St Clement, West Thurrock and St James, West Tilbury. The Lady Chapel was created in the ground floor of the tower in the mid 1930s. The 16th century oak screen, between the tower and the chancel, was originally in the chancel where the communion rail now is. The tower originally had an external stair turret in the south-west corner and indications of a doorway still exist in the middle stage. The tower clock, installed in 1988, was made in 1884 for the Grays Co-operative Society head office which stood between the Church and the railway station. The hours and quarters are struck on three of the bells. Added in 1846 with further additions in 1937, it is partly floored with medieval tiles found when the Grays stationmasters house was built in 1854. This was built in the mid 1930s for the use of the choir. As seen now this all dates from the Victorian restoration and extension of 1867. Notice the memorial tablets on the west wall of those whose graves were moved when the church was extended and, amongst the other memorials, that to the 19 who lost their lives in the burning of the training ship Goliath on the Thames in December 1875. The large board on the south wall records the Unknown Donor and the William Palmer charities. The Memorial Corner displays books recording the names of former members of the congregation and of the congregation of All Saint's, William Street, Grays (now redundant). The west and south windows were all designed by Phillipa Heskett and installed between 1973 and 1980. A description of each window and the name of the donor are on the window sills. The octagonal font dates from about 1500 and stood near the south door before the church was extended. The south porch is part of the first Victorian reconstruction but the internal doorway is probably 13th century. This was built in 1958 as a memorial of those killed in the 1939-45 war, but the outer doorway is early Norman and the oldest part of the church now recognisable. This original north doorway had been opposite to the south doorway in the earlier church and was saved in 1867 at the time of the major extension when the north aisle was added. It was recovered and built into the modern porch.